We all know that fashion can be fickle! But the little black dress has survived both time and trends. Why not try on the same timeless design concept in your home? We’d like you to slip on a few little black dressers to see how they feel. We like our dressers the same way we like our dresses – simple, classic, and endlessly versatile. We believe in starting basic and building from there. This seven-drawer style from Land of Nod is a great place to start. It offers understated style on its own, but its clean lines complement almost any design aesthetic. Not surprisingly, we’re also drawn to vintage-inspired options that add a touch of rustico to any room. 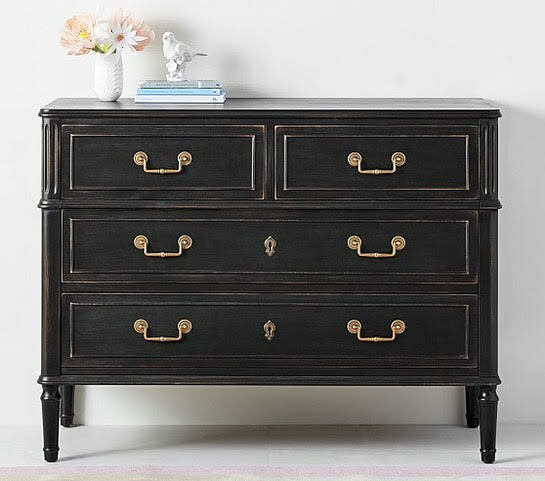 We think this three-drawer option from Wayfair is perfecto! It provides an interesting focal point for an entryway without overwhelming its subdued surroundings. A suggestion for those in search of a refined vintage vibe - this dresser from Pottery Barn Kids. We think it has the ambience of a family heirloom with style that stands up today. We simply cannot resist the country farmhouse feel of this offering from Anthropologie. It fits in perfectly with our La Finca aesthetic. The wood looks rough-hewn, and weathered. The antiqued pulls only add to its beautifully aged appearance. Its size makes it perfect for unexpected placement. We suggest trying it on as a sideboard. 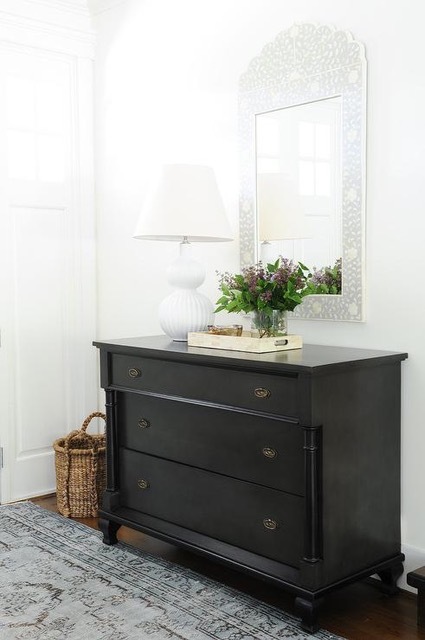 Choosing accents for your little black dresser can be even more fun than accessorizing your other LBD! We adore adding surprising details, like old books and glass curiosities. Look at the way the delicate folding mirror, denim-blue rug, and vintage plant stand infuse the room with a sense of serenity. However, the dresser would also be stunning in a more vibrant setting. It all depends on how you dress it up. The La Finca design team can’t wait to tailor an interior design especially for you. Contact us today to get started dressing up your home.